Working in red and white stoneware clay, the main body of work is thrown on the wheel and finished by hand. 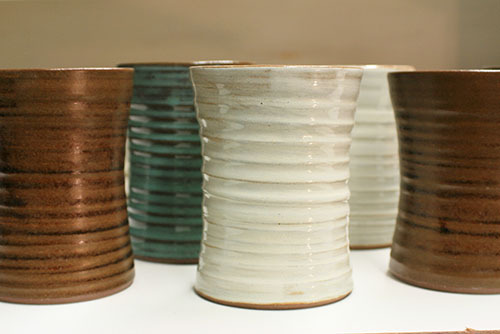 Glazes are mixed in the studio and are applied by brushing, dipping and using wax resist. With a focus on dinnerware the intent of the work is to enhance time spent around the table. The kitchen is a place where friends and families gather to enjoy the company of others. If Dayna Wagner can bring a sense of warmth, beauty and enjoyment to times of fellowship then her goal will have been achieved.